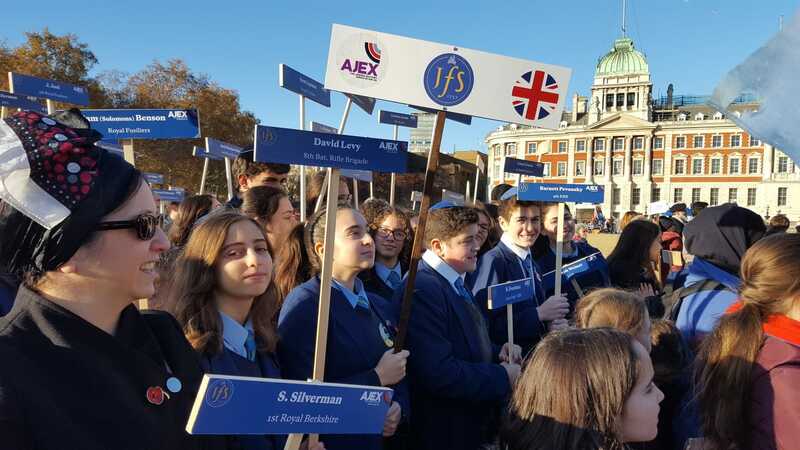 JFS lived up to the school motto of ‘light and honour’ when 250 of the school community joined the AJEX parade to demonstrate their gratitude for the sacrifices made by the veterans, and to remember those who did not return to peacetime Britain. Having researched stories of alumni in the First World War, including the 13 year old Joseph Rosenbloom who ran away to join the army in 1914, our students marched with the names of 105 JFS alumni who were casualties of war 1914-1918, determined that their boys would not be allowed to disappear from our collective memory. It was an extraordinary site and very humbling to see so many of the school taking personal responsibility for the remembrance. For many, the parade also served as a personal reminder to those who question the loyalty of the Jewish Community that Jews were at the forefront of the fight for liberty and democracy in the UK. We had set out to recruit 100 students to represent 100 years but never in our wildest dreams did we think so many would respond to our message of remembrance, responsibility and gratitude and to stand up and be counted.